Wednesday October 3rd - Green on the Screen - first Wednesday of every month. 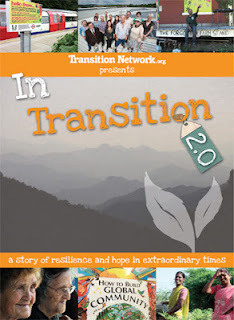 This month it's In Transition 2.0 - the Movie. Doors open 7pm, film 8pm, food available. Transition Crouch End is working towards building a resilient positive community in the face of rising oil prices, a vulnerable financial system and climate changes. We provide a rooted active community hub for local initiatives, events, re-skilling and vital community building. Collaboratively our actions are practical, positive and local. Community Supported Agriculture...seasonal farm camps and more..
Barboot-7.30-10.30pm 1st Friday of each month , the Haberdashery Cafe, Middle Lane & www.mooorsbar.com, turns into a colourful and kaleidoscopic bazaar with community artists, craftspeople and vintage sellers. 3rd Friday of each month musicians perform ' Three Songs' each, proceeds to a local cause. Draughtbusting (when demand arises) . Coming up... Home energy initiatives....Tool Library (looking for a coordinator to set up with our donated tools as well as swaps). Contact Transition Crouch End (news12a@TransitionCrouchEnd.org.uk) for more information and to get involved. 20th October ‘Apple Day’ at Hornsey Vale Community Centre (2-5pm). 27th October Dark Walk to the Fire - off grid tour of growing sites and procession. 5th December ‘Crouch End in Shorts’ with ‘Green Santa and Present promises’ and short films of our community in transition, building community resilience sustainably. Transition Crouch End - annual end of year celebration! Get those cameras rolling! Email to notify us you are including a video! Is it goodbye to the 'More than a Box Scheme'? It appears that Church Farm is seriously considering ending the 'More than a Box' scheme and this Thursday is likely to the be the last delivery to Crouch End and other drop-off points in North London. is proving problematic for the Crouch End 'More than a Box' scheme. The reasons for this are clear and understandable. The scheme has only recently started to make a profit and while it has been brilliant at promoting the idea of sustainable food, it has not proved to be sustainable in a business sense. Driving a van to London once a week is expensive and daunting for those unused to the city's traffic: it requires a high level of commitment from the volunteers on the farm. The scheme has worked until now because of the enthusiasm of interns, Sam and Laura who have seen the value of giving an urban community access to food straight from the producers. But with both these individuals moving to different roles, the continuity of purpose is likely to go with them. It was Sam's idea to bring the farm to London. He is the co-founder of the Agrarian Renaissance, a movement which aims to reinvent farms as 'multi-faceted rural hubs with sustainable food production, and direct distribution'. He was and is passionate about the idea of a close relationship between the farm which provides the food and the people who consume it, particularly in an urban context, where most of our access to food is mediated by supermarkets. Working with Transition Crouch End, the scheme began in July 2010, then a parked van with boxes for people to pick up on a Thursday evening. Issues with street trading led to a move to the Haberdashery, a vibrant local cafe which was becoming a hub of the community. Since then the drop-off points have expanded to a local community centre and to other parts of North London. Members of the 'More than a Box' scheme have appreciated the fresh seasonal food and exceptional range of meat and vegetables. 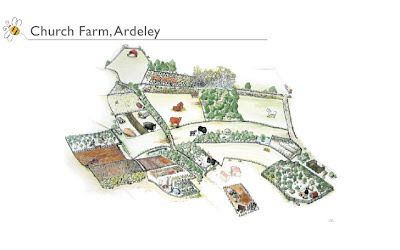 Direct communication with the farm has led to a more streamlined, customised service which may have benefited members of the scheme outside London. (In the beginning the meat box contained sausages, mince and a joint, and was very difficult to get through in one week!) Members have appreciated the ethics of the source of their food: the high level of animal welfare, the support for an enterprise committed to mixed farming and the concomitant rejection of supermarket hegemony. But more than that (hence the name) have been the visits to the farm, to stay or volunteer or just hang out with the animals. The farm is a magical place: two of my favourite visits were when we took part in the Supermoon Walk in March 2011, and when we caught the wave of bluebells in the wood in April. It may even be that the London contingent of the members' scheme appreciate the farm more than the local members: it is an escape. But the scheme has also developed a local presence in Crouch End. Members and farm representatives have featured in the local press several times, promoting the box and explaining its values. Sam has represented the farm at two AGMs for Transition Crouch End and the farm provided the catering for the Muswell Hill Sustainability Group's meeting on sustainable food. Livestock from the farm were a star attraction in the Crouch End Festival, featured in the local press (twice) and are now enshrined in the festival publicity. 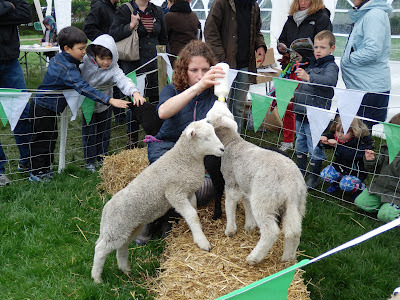 The day the Church Farm lambs came to Stationers Park may well be the box scheme's finest moment. They inspired a raft of wool-themed activities in the local community centre and delighted the local children, and the scheme gained two more customers. As I write the blog begins to feel like a valediction to an initiative that has been running for just over two years. It does not seem likely to continue in its present form, but as a loyal member from the beginning I would like to keep a few doors open. Alexandra Park Farmers' Market attracts between 30 and 50 producers every Sunday, as well as 1,500 to 2000 visitors but it is not the only market in town. Harringay Market was launched on 24 June and takes place every Sunday at North Harringay Primary School and on 1 September another market opened up in Bounds Green School. These small ventures may be a foothold for the farm to maintain that special relationship with North London, forged in Crouch End. Members visiting these markets would be able to support a local enterprise in a neighbouring area. I for one would be happy to go the extra distance to keep the box scheme alive.